This is another book which suggests it contains previously unknown facts. I'm not sure what the picture of Sister Janet on the cover is all about. This is the description I found. 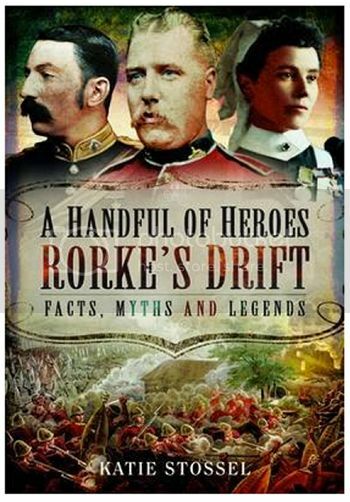 "Thanks to newly discovered letters and documents, A Handful of Heroes updates the history of the Defence of Rorke's Drift, which will forever be one of the most celebrated British feats of arms. Remarkably after such prolonged historical scrutiny, the author's research proves that there is yet more to discover about this famous incident of the Zulu War 1879 and her superbly researched book reveals a number of myths that have distorted what happened during the gallant defence of the small Mission Station. For example, it transpires that the isolated outpost was already well prepared for an attack by experts in field defence. While this in no way denigrates the heroic efforts of the heavily out-numbered defenders, it does help to explain the successful defence against seemingly overwhelming odds This fascinating and highly readable account goes on to examine in detail the famous Chard Report which has long been relied on by historians and authors. Doubts emerge as to its accuracy and evidence is provided which suggests the Report's author was coerced by a senior officer in order to protect the latter's reputation.Likewise the letters of August Hammar, a young Swedish visitor to the Mission, put Reverend Otto Witt's false account into perspective. 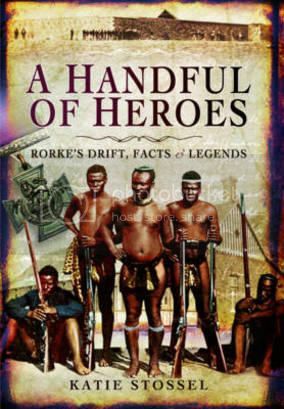 These and other revelations make A Handful of Heroes a fresh and important addition to the bibliography of this legendary Zulu War engagement." The presence of Sister Janet is due to a previous book on her by the author. Hopefully there is more evidence in the book to justify her position. I found this alternative cover. Confused? This doesn't have Myths in the description. As long as the publisher puts RD in the title they'll sell a few copies. Any one know/heard of the author? Yes, she is a nurse and the wife of the heart consultant who treated Adrian Greaves. Amazon says that it's going to be published by Pen & Sword on 30th June, and the price should be £19.99. Amazon are now saying that the publication date is 1st July 2015, but also that it has not yet been released as of today. The price remains £19.99, but at least two suppliers are offering it ("New") for around £15.00. Has anyone seen this at all, please? I am not an expert but personally found the book full of "myths"
Is it worth getting hold of Robin? Robin, that quote doesn't make sense to me. In any event, did he mean the early morning of the 22nd? Where is he getting his information. Were there credits? It sounds like we've all had to wait for this in order to get the true facts. I'm almost tempted to buy a copy. Almost. 2nd The Hlubi were Sesotho, I accept that the Hlubi were "driven" into Lesotho by Durnford at Bushman River Pass, but I think they retained their Hlubi identity closer to Zulu than Sesotho. Again I welcome advice. Ken??? I think that I'll spend my money on something else!